I met Aisa through her sister Carmie, and we formed an instant connection, because aside from having the same name, Aisa radiates happiness and love. Naturally, I was all in when she asked me to be a part of her wedding. Here are some of the things I’ve done for her and her husband, Migui. 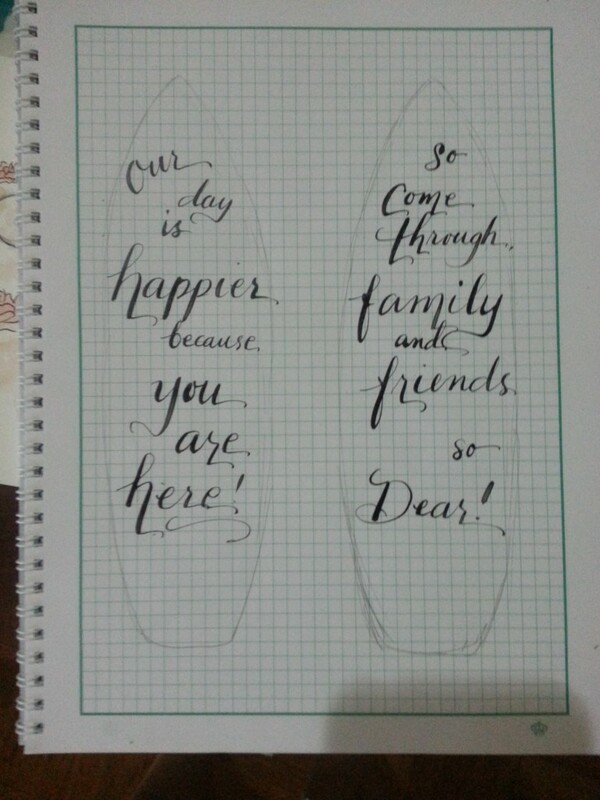 The first thing Aisa asked was to write on the envelopes of her wedding invitation. 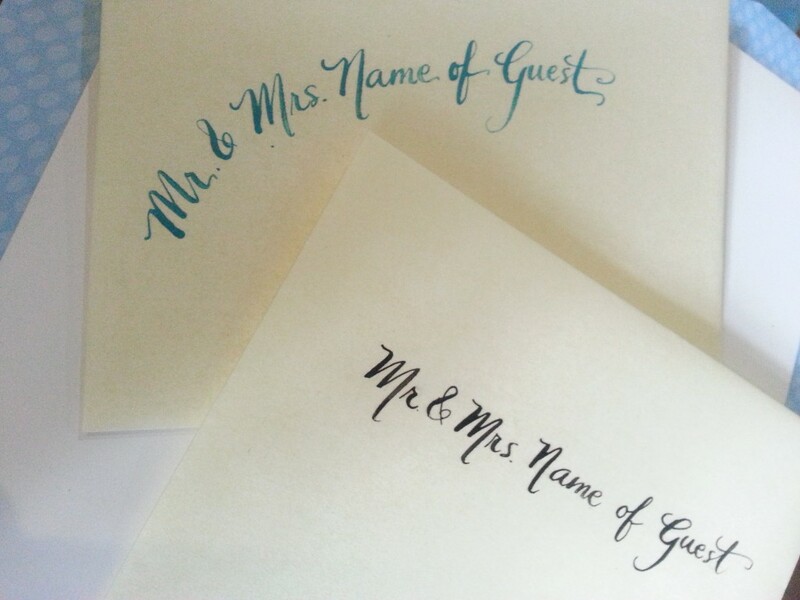 Her wedding invitation was simple and fun and she wanted her envelopes to be the same way. Her color scheme was aqua and brown and we picked aqua to be the color of the invites. I designed the lettering to be similar to the monogram, and it took me a while to get the font right. I’m glad she liked it on the first go. I liked how the envelope was made out of parchment paper. It cut my work time as I did not need to have to line the envelopes. I just got a lined card that snugly fit the envelopes and wrote straight away. 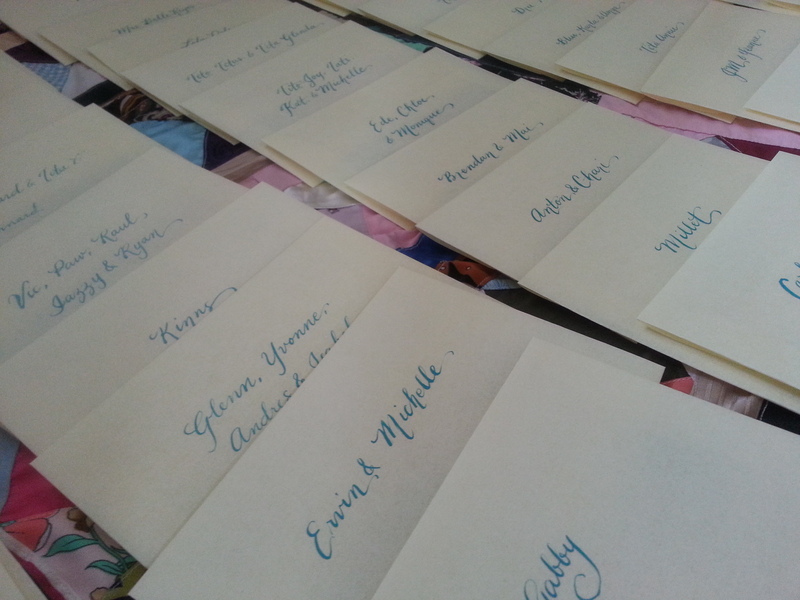 The couple asked to write nick names and monickers on the envelopes and it was fun guessing who these people are. Aside from that, Migui and Aisa also asked to have leather-sleeved journals made as gifts for their Ninongs. They had already bought fountain pens and they thought that the journals made a nice accompaniment to them. 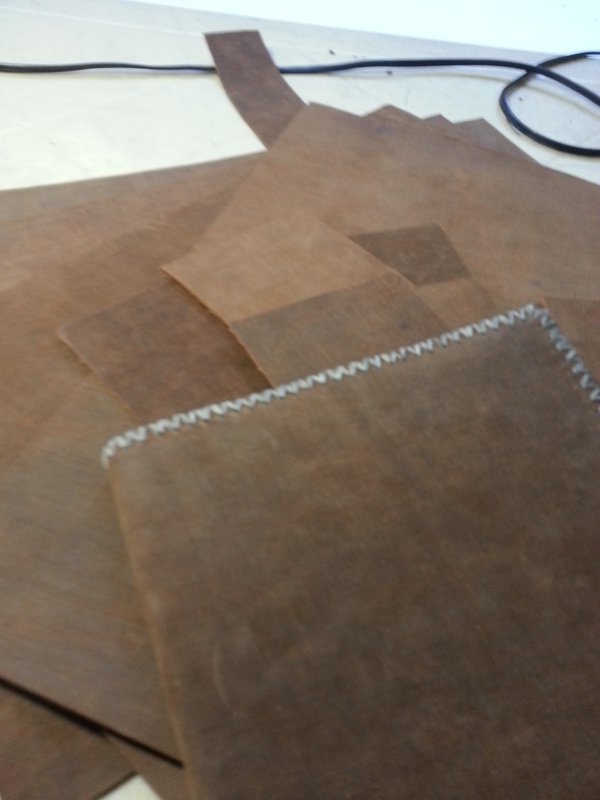 The journals are made out of raw, untreated leather stitched with abaca yarn. 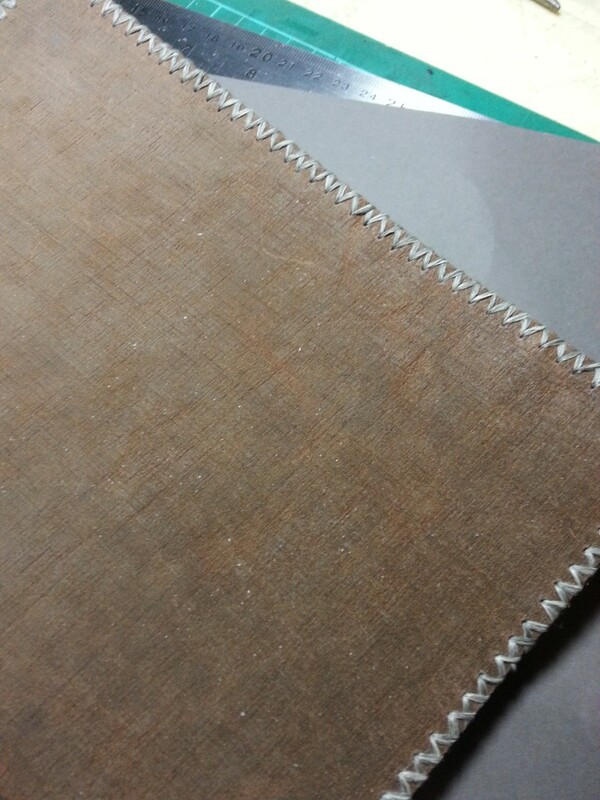 The leather is rough to the touch, which added to the rustic theme the couple wanted. They also chose dotted lines as inside sheets, to add a unique touch to it. The best project they asked me to do was to write their welcome signs on SURFBOARDS. Yes, you read it right! 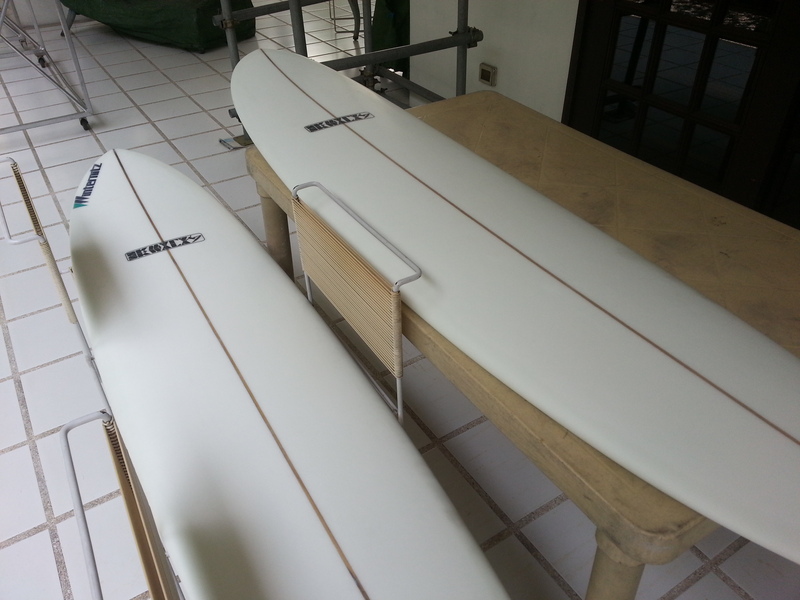 These two surfers had boards shaped and asked me to have them painted. I used brown acrylic paint (I mixed a little gold to add some glimmer when the sun hits the boards) for the letters and teal for its shadows. The boards are ready to be painted on! This is the study of the boards. The calligraphy here is the same as the wedding invites! Migui+Aisa SDE from Ian Santillan on Vimeo. Yay! Congrats again Migui and Aisa! 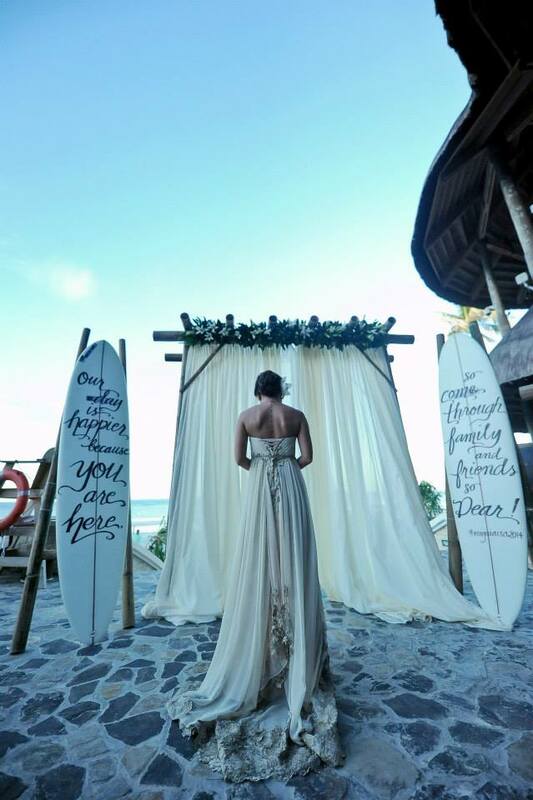 The beautiful bride entering her ceremony with the surfboards at the background. Photo courtesy of Ian Santillan.